The third round had both of the extremes: Two games ended peacefully in short order, while the other three were quite complex. 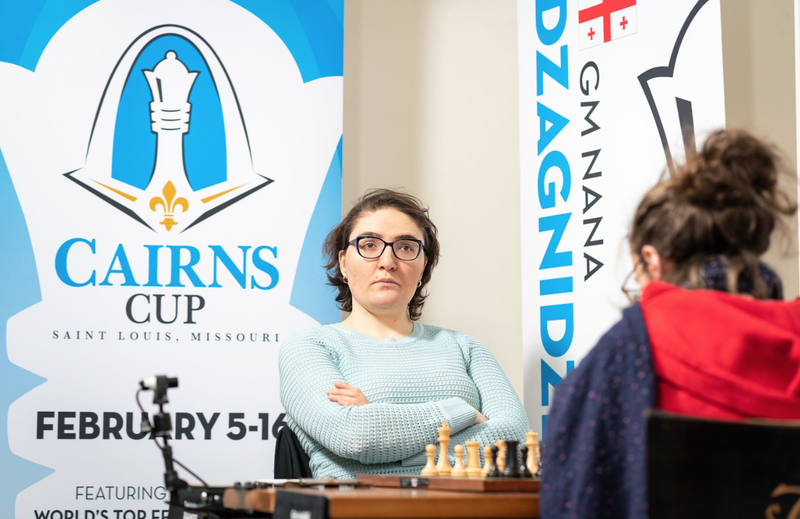 Former Women’s World Champion Alexandra Kosteniuk showed her class with a nice victory over young IM Zhansaya Abdumalik, pulling ahead of her rivals with a score of 2.5/3. IM Anna Zatonskih and GM Nana Dzagnidze also picked up their first wins. Let’s take a look at all the results and a summary of the action. Kosteniuk opted for the Archangel variation of the Lopez against her young opponent. Zhansaya essayed a fairly safe setup with Be3-Nbd7, but after Alexandra challenged the center with 14… c5 the game looked about equal. At some point soon after, however, Zhansaya seemed to lose her way. Taking on b6 at the wrong moment was likely to blame, and Kosteniuk won a pawn using a nasty tactic. Abdumalik managed to win it back, but at the cost of severely weakening her king. While it wasn’t so clear at first, a couple mistakes were mercilessly punished by the former Women’s World Champion. Alexandra put enormous pressure on Zhansaya’s kingside, and, in time pressure, the young Kazakh IM was unable to resist. As Jen Shahade said, a “relentless” performance by Kosteniuk. Gunina tried 5. Bd3 against a Petroff, but nothing really materialized for her, and pretty soon the position became quite dry and equal. Neither side was able to make any progress, and many minors were traded. Both players tried a few things, but neither side could realistically hope for much. They repeated at around move 30. A 3rd draw for Harika, while Valentina remains at +1. Irina played one of her favorite openings, the Classical Sicilian, and Elisabeth took on f6 earlier than is typical. If the queens remained on the board there may have been some interesting chances, but once they came off, White’s busted queenside structure compensated for the fact Paehtz had an extra pawn. Irina forced a perpetual as soon as a rook ending was reached, and while it wasn’t completely forced, it was clear neither side had much to play for. Krush therefore solidifies her plus score, Elisabeth gets on the board, and, in short, neither player will be too disappointed by the result. 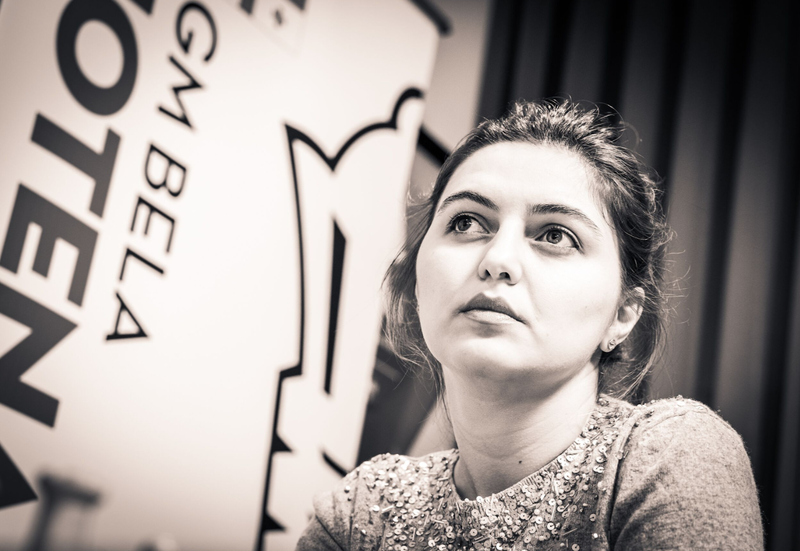 Bela decided to steer clear of more theoretical waters by playing 2… c5 against d4-c4, but rather than going for a direct benko or benoni, she fianchettoed her kingside bishop and castled early. This lead to a position where White has a clear central space advantage, but doesn’t have the juicy c4 square for the knight that is typical in a Benoni. 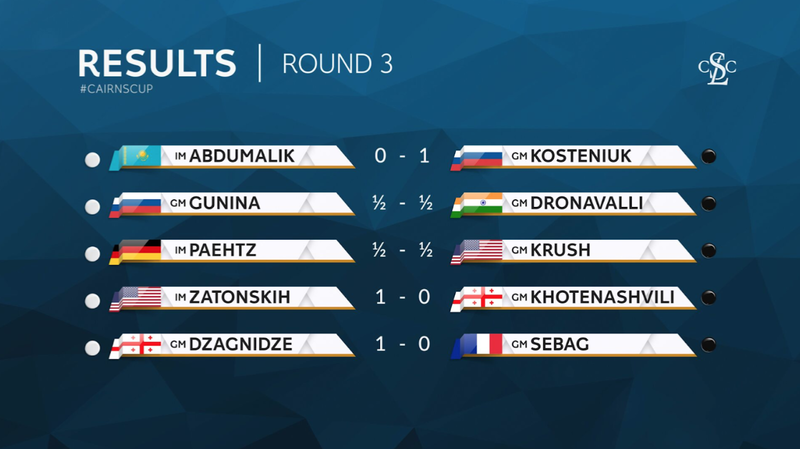 Zatonskih played solid and strong moves, while Khotenashvili made some decisions that were difficult to understand, one being 19… Qb6. Bela did a good job of mixing up the game after that, although Anna never seemed to relinquish control of the position. Once the position simplified to an ending and Black’s pawn on d6 fell, there was no counterplay left to be had. Anna’s technique in the ending was textbook. With this win, Zatonskih moves up to 50%, while Bela falls to -1 after he third decisive game in a row. Nana prepared a rossolimo against Marie, the same opening that the French GM faced in round one, but deviated by putting the queen on e2 instead of playing Re1. This has the added benefit of putting pressure on the c4 pawn, which she used right away. Sebag not only had a weak c4 pawn to deal with, but her kingside also lacked development. Nana’s decision to close the position with 17. D5 was slightly puzzling, as most commentators were expecting White to continue with her initiative with a move like Nb5. It still looked cramped for Black, so Sebag understandably sacked a knight for White’s central pawns that were suffocating her pieces. This was both a fine decision, both objectively and practically, and Marie definitely stirred up a lot of trouble for Nana. It nearly succeeded, especially with both players low on time, but eventually White was able to steer the game into a simplified position where she was up a piece for two pawns. The Georgian GM went into lockdown mode after that, and reeled in the full point in convincing fashion. This enabled Dzagnidze to rebound from her round one loss, and put Sebag back to -1. 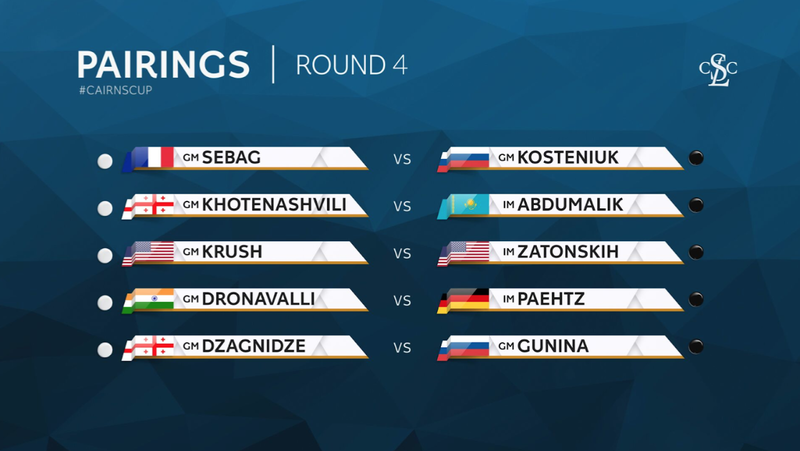 Quite a round, and round 4 matchups also look quite promising. The two Americans, Krush and Zatonskih, will add another encounter to their long history. The other games should also give us plenty to take in. Check out the action tomorrow at 1PM local time.